Using the accepted wisdom that bigger is better, the Bravia KDL-55V5500 52in giant from Sony's mid-priced, V Series definitely demands an audition. It may not be as slim, or stylish as LCD TVs in the manufacturer's W, E, Z or X Series, looking a little boxy from the side, but the KDL-52V5500 is saved by a few neat design flourishes. The clear plastic window, mirrored in part, helps to give the impression of a free-hanging speaker bar. The dark, slightly speckled finish is undeniably appealing, too. 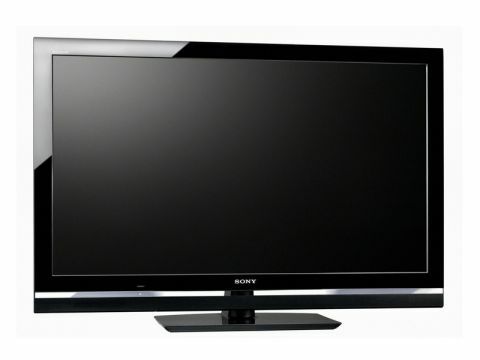 The V-Series sets (also available in 32in, 37in, 40in and 46in screen sizes) aren't quite as laden with goodies as its premium lines, but this 52in model does offer AppliCast, Sony's take on internet widgets and the ability to stream media from a PC on the network. There's no Freesat tuner on this model but the user interface is superb and accessing the regular Freeview channels is especially easy with Sony's intuitive remote. Connectivity hits the spot. The four HDMI inputs can be used to hook up a Blu-ray player, PS3 console, Sky HD set-top box and Freesat HD tuner simultaneously. There's also an USB port, but no MemoryStick slot, which is odd, seeing as it's Sony's own proprietary storage format. Sony's S-Master speakers take up most of the bottom bar and the digital amplification means you'll be able to watch daytime TV without feeling the need to boot up your amplifier and surround speakers. In action, Sony's V-Series panel delivers an impressively detailed, pin-sharp picture that loves high-definition feeds, especially Blu-ray. Images are impressively bright and eye-catching with just standard halogen backlighting. This is partly because the default colour, brightness and sharpness all tend to be pumped up for attracting attention in the shop, but also because the full HD LCD screen looks especially detailed with Blu-ray movies. The Bravia Engine 3 that handles all the video processing is a robust affair. With 200Hz motion processing switched on, images look more convincing and more fluid than you'd expect. Finally, the revealing screen can be a little unforgiving of poor standard-definition sources, but the Freeview channels from the in-built tuner don't look too messy and are always watchable.